If you have a long-haired kitty, there are times it may make sense to take him to a groomer who specializes in lion cuts for cats. Lion cuts aren't always the right choice, but this method of shaving a cat's body and leaving his face and neck fur intact can be beneficial during especially hot seasons or if your cat is prone to mats. Leaving the chest hair intact as part of the "mane"
While cats given a lion cut certainly have style, this is not generally the reason the cat is shaved. There are several reasons why it may be a good idea to have your cat given this cut, at least temporarily. Long-haired cats need a great deal of grooming. While most cats do self-groom, long-haired breeds require more care. Their fur should be brushed or combed on a weekly basis to help with shedding and to reduce mats. Busy cat owners may find that clipping their long-haired cats into a lion cut can help cut down on the amount of grooming that is required. If the cat is not brushed regularly, or has a hard time with self-grooming, mats may build up in the fur. If these mats are left alone, they may twist, pinch or otherwise harm the skin beneath them, leading to open wounds. Cats that develop frequent mats, or that have fur that has become heavily matted can be given a lion cut to help deal with the problem. During warmer weather as your cat begins to shed, your long-haired breed may be at a higher risk of developing hairballs. As the cat grooms his shedding fur, he may ingest more than can be safely passed through his digestive system. This can lead to vomiting, choking or bowel obstructions that may require surgery. Clipping the fur into a lion cut eliminates this problem. If you live in a warm climate, your long-haired cat may have difficulty dealing with the heat. 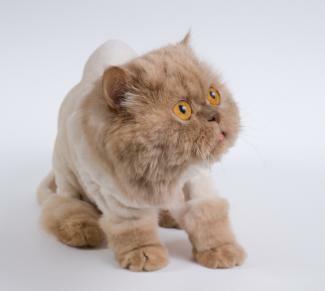 Lion cuts greatly reduce the amount of hair on a cat, helping her stay cooler during the hotter months. If your cat is older, obese or depressed, he may have difficulty keeping himself clean and well groomed. Cats with longer fur may have increased difficulty with self-care as they age, because they may not have the flexibility to reach all their fur. Clipping them into a lion cut can help your cat self-groom more effectively. 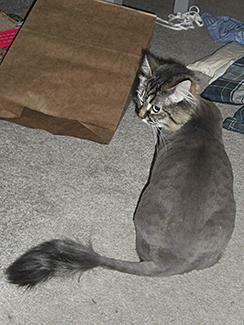 While the lion cut is largely beneficial to both cats and their owners, there can be a few drawbacks to it as well. 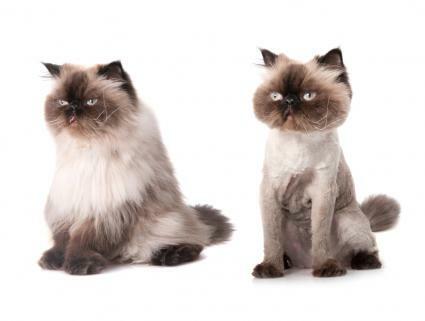 Some cats may not object to being shaved, but for others it may be a stressful situation. Lion cuts are usually given at vet's offices or pet groomers, which means a trip in a car and an unfamiliar situation for your cat to be in. For some cats, the anxiety may be so great they need to be sedated before being clipped. If you keep your cat in a lion cut for long periods of time, the expense can add up. Depending on how thick your cat's fur is, how fast it grows, and how fast mats or other problems develop, you may be looking at monthly trips to the groomer or vet. For many long-haired cats, a lion cut can help with many of the problems that long-haired breeds face. Consider getting your cat clipped if any of these issues arise and enjoy her new look while it lasts.